It’s been in the upper-60°s this week and all I want to do is go play at the beach. I didn’t get away to the coast even once this past summer, so I am going through a major double-winter ocean withdrawal. Stores are starting to get in their Spring/Summer collections and I keep bookmarking pieces I want for my imaginary beach vacation. 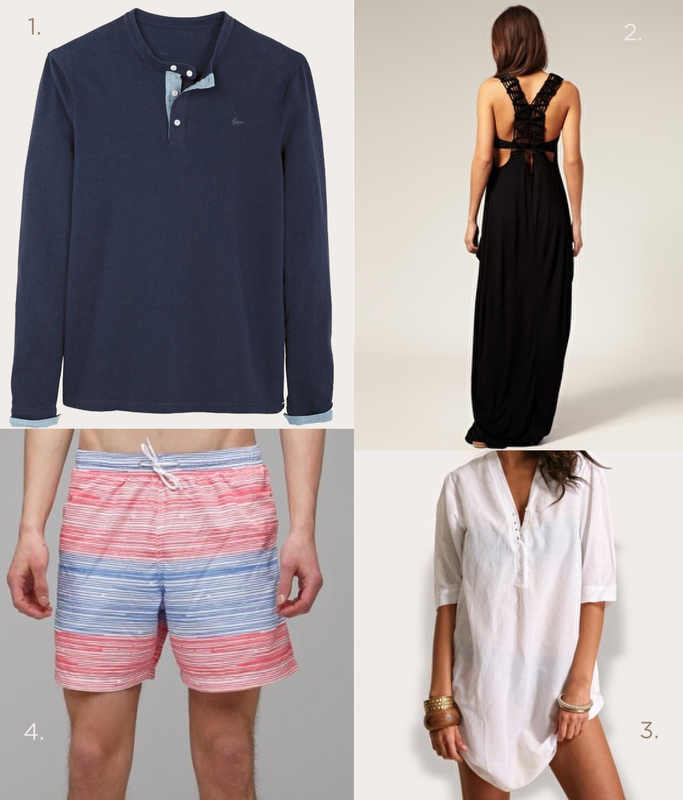 Even men’s summer pieces! I can’t help it. I need some ocean + sand to soothe my soul. I know the men’s henley doesn’t seem very logical but one of my favorite parts about going to the beach is at night when your skin gets cold from being in the sun all day. Boyfriend’s oversized (on you) super-soft cotton shirt? Does the trick. And Franks is a line of board shorts out of Australia that I love – mainly because they offer American style and European style swim shorts with a few somewhere in between (like the one pictured, although I love the throwback feel of this one too). for music shows so it was fun to wander a bit. and coveted everything in Paradiso. I’m going away this weekend with my two best friends for a joint birthday celebration. The forecast is h o t and I’m wishing I had a small, over-the-shoulder bag like this one to throw on with a sundress and sandals to go on our adventures. We just booked a weekend trip for July to a nearby lake (houseboat!) and I think I need this little beauty to keep me from becoming a lobster the first day. And then I need these for lounging in the evenings! Sorry I've been quiet lately. Work is super busy and I've been trying to enjoy the beautiful weather out when I get home. Seventy degrees in March? I'll take it!